Born in Florida, Carter received a thorough training as a modern guitarist with Bruce Holzman at The Florida State University before falling in love with the earlier plucked instruments and the world of historical performance. Following initial guidance from Pat O’Brien in New York City, he travelled to London as a Fulbright Scholar where he studied the Lute with Nigel North and quickly established himself as one of the leading players on old instruments. Concert tours and festival appearances followed throughout Europe, Asia and North and South America both as an orchestral player and as a chamber musician and soloist with his own group, Palladians. 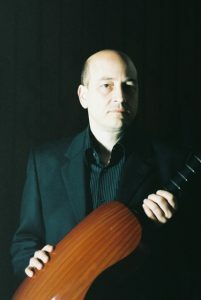 Carter has an extensive discography (including 10 CD’s with Palladians) and has featured on numerous recordings of the Academy of Ancient Music and The English Concert, for both of which he acts as principal lutenist. He is also an enthusiastic teacher and is Professor of Baroque Studies and Lute at The Guildhall School of Music and Drama in London. 2005 saw a new development in Carter’s career as his exploration of the world of the baroque guitar led to the release of his first solo album ‘La Guitarre Royalle: The music of Francesco Corbetta’ (Linn CKD 185) which has been widely praised and named in Gramophone’s ‘Critic’s Choice’ list for 2005.